Overview - In the 1970s, the name James L. Brooks was synonymous with intelligent television comedy—his shows were insightful about work and love and always tapped into the zeitgeist. With his transition to film in the 1980s, he became a master Hollywood storyteller, and none of his films was more quintessentially Brooks than Broadcast News. This caustic inside look at the Washington news media stars Holly Hunter, in her breakout role, as a feisty television producer torn between an ambitious yet dim anchorman (William Hurt) and her closest confidant, a cynical veteran reporter (Albert Brooks). Brooks’s witty, gently prophetic entertain­ment is a captivating transmission from an era in which ideas on love and media were rapidly changing. The joy of watching a James L. Brooks film ('Terms of Endearment,' 'As Good As It Gets') is in the dialogue and the interactions between characters. Granted, his latest feature ('How Do You Know') didn't quite live up to his previous works, but that same aspect of entertainment remains apparent. His comedies don't rely completely on pratfalls or stupid behavior, although it can happen on occasion, generally as a character trait or resulting from some environmental factor. The focus of a Brooks story is on the people themselves, their conversations, and how difficult it can be to make a connection when all it takes is simply being honest. His films genuinely feel like a small slice of life unfolding on screen, displaying many of our insecurities and idiosyncrasies. In 'Broadcast News,' life is set against the hurly-burly chaos of the news media, a tumultuous and highly-competitive atmosphere where delivering world events seems to take precedence over having a social life. Out of the bedlam, a love triangle blossoms and complicates the lives of three rather unusual individuals. Before seeing how they come together as adults, Brooks introduces audiences to their younger counterparts, establishing their eccentric quirks early on and having that impinge upon our understanding of them. This is one part of what makes the film so special and charming. The other element is in watching a unique romantic comedy that goes against convention, a characteristic for which it is best known, and actually using the formula as a subplot for a larger idea. At the center of the romance is Jane Craig (Holly Hunter), a brilliant but neurotic producer with a talent for crafting a heartfelt story from any subject matter. Her crying outbursts are as pitying and pathetic as they are oddly funny and revealing, a woman desperate for companionship and intimacy. Former sports commentator Tom Grunick (William Hurt) is a charismatic anchorman with a face made for television. He knows he's not the smartest guy around, riding a wave of luck based on his looks, but he's fascinated by Jane's intelligence and energy while also hiding his constant self-doubt. Aaron Altman (Albert Brooks) is Jane's long-time friend and highly-skilled investigative reporter. His jealousy and bitterness grows from his secret love for Jane and his ambition to one day anchor. The beauty and cleverness of 'Broadcast News' comes from the lack of communication between these three — their inability to be forthright and just say what they really mean. They're proficient at reporting major world events, as seen in the brilliantly-crafted sequence involving the bombing of a U.S. military base, and they display a talent for capturing the deeply emotional stories of strangers. Yet they're inept at living their own private moments. Jane's compulsive and intense personality, which benefits her in the newsroom, intrudes upon her romantic encounters with Tom. Aaron seems to be reliving high school, as once again the popular pretty-boy is allowed to come out on top. Tom is a nice-enough guy, but he personifies the compromised future of TV media, which Jane has argued against. In one scene, he tells Aaron of the need to sell a product to viewers. James L. Brooks' biting romantic comedy offers an amusing look at the frenzied world of television news reporting, with a personal and perceptive story at its core. Along with memorable supporting performances by Joan Cusack and Jack Nicholson, Hunter, Hurt, and Brooks deliver rich, hilarious portrayals of three career-minded individuals with little talent for dealing into the real world. Brooks marvelously places his audience right in the middle of this chaotic universe and this mess of a relationship, intimating how they each affects the other. 'Broadcast News' shows things in life don't always work out the way we wish them to, while simultaneously creating a wry satire about the media slowly replacing genuine human emotion with acting skills. This Blu-ray edition of 'Broadcast News' comes courtesy of The Criterion Collection (spine #552) on a Region A locked, BD50 disc and housed in their standard clear keepcase. Accompanying the disc is a 16-page booklet with color pictures of the film and comes with a very good essay entitled "Lines and Deadlines" by Carrie Rickey. There are no trailers or promos before being greeted by the distributor's normal menu options. 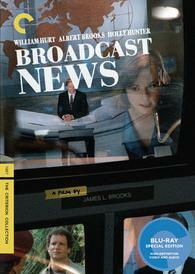 As stated in the accompanying booklet, 'Broadcast News' receives a brand-new high-definition transfer at 4k resolution from the original camera negatives. Approved by director James L. Brooks and editor Richard Marks, the results are grand as this 1080p/AVC MPEG-4 encode (1.85:1) looks fantastic if only hindered by age. The picture is much softer than would be expected after reading of the remastering efforts performed, but it's easily excused as an acceptable aspect of the cinematography and the period in which it was shot. Still, the video shows terrific resolution throughout, with excellent clarity and sharp detailing of small objects. Fine lines and textures in the faces of actors, clothing and architecture are distinct and clearly visible, even in dimly-lit interiors. Contrast is pitch-perfect with crisp, brilliant whites, and black levels are lush and accurately rendered, providing the transfer with a good depth of field. The image is also awash in a slight layer of grain for that wonderful film-like appearance. Colors receive the biggest benefit, as primaries pop off the screen with energy and vibrancy, while a lovely, bright variation in the secondary hues gives the comedy a healthy and lively quality. All in all, the James L. Brooks 80s favorite looks marvelous on Blu-ray. Like the video, 'Broadcast News' also receives the high-quality remastering treatment, and once again, the results in a splendid stereo presentation full of warmth and activity. Dialogue reproduction is intelligible and precise, hearing every subtle line clearly and understanding every emotional tone in the voices of actors decidedly. The front soundstage feels impressively spacious and welcoming with terrific fluid movement between the three channels, displaying the hustle and bustle commotion of a network office with fantastic fidelity and authenticity. The DTS-HD Master Audio soundtrack also exhibits a strong, well-balanced dynamic range, and low bass is mostly contained in the voices of actors. Overall, it's a great lossless mix for a wonderfully unique romantic dramedy. For this Blu-ray edition of 'Broadcast News,' The Criterion Collection offers fans a newly-recorded and satisfying collection of supplements, made special just for this new home video release of the 80s romcom. Audio Commentary — Offering a very enjoyable and affable commentary, director James L. Brooks and editor Richard Marks headline this conversation. Recorded recently for this release, Brooks does almost all of the talking, while Marks sits quietly, contributing the occasional monotonous remark. There are a few gaps of silence here and there, but Brooks is so informative about the characters, cast and the filming that the track is a worthwhile listen. The filmmaker does terrifically also explaining certain camera techniques and some of the meaningful aspects of the story. James L. Brooks: A Singular Voice (HD, 36 min) — Made exclusively for this Criterion edition of the movie, the three-part documentary is a look at Brooks' influential career and features interviews of the people who have had the pleasure of working with the director, writer and producer. First, the piece begins with his humble beginnings in television and awarding-winning recognition on 'The Mary Tyler Moore Show' ("Groundbreaking television"). This is followed by his move into motion pictures ("Moving into film"), and it all ends with a few comments on Brooks' passion for helping young, talented filmmakers get started in the business ("The Zeitgeist"). Interview (HD, 17 min) — This is a surprisingly interesting interview with Susan Zirinsky and definitely recommended for fans of the film. The veteran television executive producer served as the model for the Jane Craig character and advised Brooks during the filming of 'Broadcast News.' Part of what makes this so fascinating is her uncanny resemblance to the character and Holly Hunter's performance of her. Featurette (1080i/60, 8 min) — This vintage EPK piece is typical promo material that quickly summarizes the plot and describes character in simple terms. Cast talks about their respective roles and about working with Brooks. Interviews and On-Set Footage (1080i/60, 19 min) — As the title suggests, this is basically a collection of interview segments and behind-the-scene footage which didn't make onto the above piece. Alternate Ending (HD, 10 min) — For fans of 'Broadcast News,' this is a definite must-watch. Brooks offers a commentary that explains his reasoning for this possible conclusion, which was considered before deciding on the superior ending. Deleted Scenes (HD, 20 min) — This is a fairly extensive assortment of conversations that never made into the final cut. Alone, the scenes are quite funny and a good watch, but would've likely dragged the story down. Trailer (HD) — The original theatrical preview completes the collection of supplements. 'Broadcast News' is James L. Brooks' second feature film, starring William Hurt, Albert Brooks, and a young, unknown actress named Holly Hunter. The romantic dramedy is an insightful portrait about modern love, the wild commotion of network news, and our insecurities in expressing how we truly feel while living in the moment. The Blu-ray shows an excellent, newly-remastered picture quality and a splendid audio presentation also minted from the original source materials. The supplements are a new set of extras produced especially for this Criterion Collection release, and they offer a terrific assortment that provides further insight into the film and its story. All in all, this is a great package and comes recommended.